Total member business loans for the credit union industry have increased $5.7 billion in the past year. Total commercial loans have increased even more — $6.9 billion. As part of the NCUA’s Regulatory Modernization Initiative, the regulator has made changes to the 5300 Call Report to give credit unions greater flexibility in providing commercial and business loans to their members. For example, the NCUA started segmenting member business lending and commercial lending in the third quarter of 2017. Prior to this, credit unions reported all business-purpose loans as member business lending. Today, credit unions report member business lending under a single account code and all other business loans under designated commercial lending fields. In the third quarter of 2018, the NCUA retired the account code for net member business loan balances comprised of one-to-four family residential properties. A new law passed by Congress allows credit unions to designate loans secured by these properties as member business, regardless of whether the dwelling is the member’s primary residence. Previously, the law stipulated these loans could only be categorized as MBL if the property was the member’s primary residence. Since these changes, member business lending growth has accelerated 1.7 percentage points. The industry reported MBL growth of 7.5% in the third quarter of 2017. It reported growth of 9.2% one year later, underscoring the continued, increasing member support credit unions provide via business financing. Member business loans at credit unions reached $68.0 billion in the third quarter of 2018. That’s an annual increase of 9.2%, or $5.7 billion. As of Sept. 30, member business loans comprised 6.6% of total loans. This is a drop of 2 basis points from a year ago. Credit unions in Wisconsin contributed more in member business loans than any other state this past year. MBL loans in the Badger State jumped 29.9%, $960.1 million, and totaled $4.2 billion at the end of the third quarter. Credit unions in the NCUA Central Region reported the largest year-over-year growth in MBL balances — $1.5 billion. MBL balances for the region totaled $14.7 billion as of Sept. 30.
Credit unions reported an 11.0% year-over-year increase in total commercial loan balances. This loan segment jumped from $63.3 billion in the third quarter of 2017 to $70.8 billion in the third quarter of 2018. The average balance of the commercial lending portfolio at credit unions in the third quarter was $12.7 million. As of Sept. 30, 2018, commercial loans comprised 6.8% of the $1.0 trillion total lending portfolio at credit unions. That’s up 9 basis points from the same time last year. Commercial loan balances to members increased 9.9% year-over-year, from $54.5 billion in the third quarter of 2017 to $59.9 billion in the third quarter of 2018. As of the third quarter, these loans made up 84.6% of total commercial loan balances at credit unions. Purchased non-member commercial loan balances increased 17.5% year-over-year, from $9.3 billion to $10.9 billion. 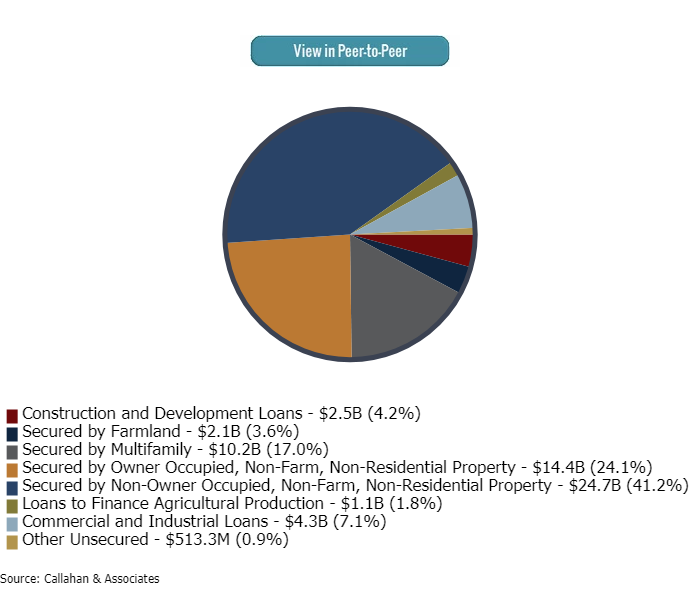 These loans accounted for the remaining 15.4% of the commercial loan portfolio. Commercial loans secured by non-owner occupied, non-farm, and non-residential property represented the majority of both the member and non-member commercial loan portfolios, at 41.2% and 51.8%, respectively . Construction and development loans, which increased 27.2% year-over-year to $615.9 million as of Sept. 30, was the fastest-growing segment. More than half of the non-member commercial portfolio can be attributed to commercial loans secured by non-owner occupied, non-farm, and non-residential property. Member commercial loans totaled $59.9 billion as of third quarter 2018. Manually tracking lending metrics can be time-consuming, but with Callahan Analytics, it only takes a few minutes to see how you compare against your peers. Stay ahead of the trends.